What kid doesn’t love Nutella? 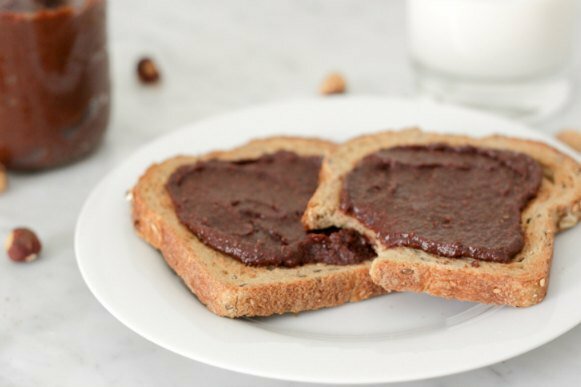 Now you can feel good about serving this beloved hazelnut chocolate spread with a low-sugar, more nutritious recipe. Back in high school, a friend blew my mind. One day over lunch we were comparing foods we like and don’t like. Innocent banter. Until she dropped a bombshell. I must have looked at her like a scientist who’d just found a previously undiscovered species. How on this earth could anyone not like chocolate? To this day I have a hard time coming to terms with it. I’m a self-declared chocolate snob. But even though I will only eat chocolate with 70% cacao or higher (I warned you – snob…) somehow Nutella makes the cut for me. The combination of hazelnuts and cocoa in a creamy spread is too hard to resist. I remember the first time my daughters tasted Nutella. We were in a creperie and after lunch I treated them to a Nutella crepe. Almost as soon as I cut the thin layers of pancake into squares, they disappeared from the plate. Big chocolate-smudged smiles came across my daughters’ faces as they relished this new treat. After that, a whole new world opened up to them – Nutella was everywhere. In kids lunch boxes. At playdates. On grocery shelves. “Can I have Nutella and white bread sandwiches for lunch?” my younger daughter asked me recently saying that a friend brings this to school every day. 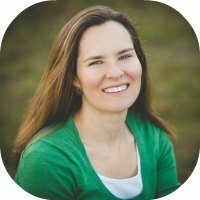 But as I thought about her question, I began to realize there probably was a way to give my daughter what she wanted in a healthier form. I soon came across a Nutella recipe in Sarah Wilson’s I Quit Sugar cookbook. 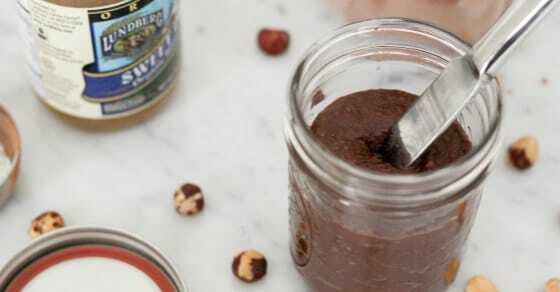 This version of Nutella is heavy on the hazelnuts, uses healthy coconut milk to bring a creaminess to the mixture and uses cacao – a less processed, more nutritious form of cocoa powder. It also calls for fructose-free brown rice syrup – my preferred method of adding sweetness. Unfortunately, brown rice syrup wasn’t appealing to my girls in this recipe, so I switched to maple syrup instead. 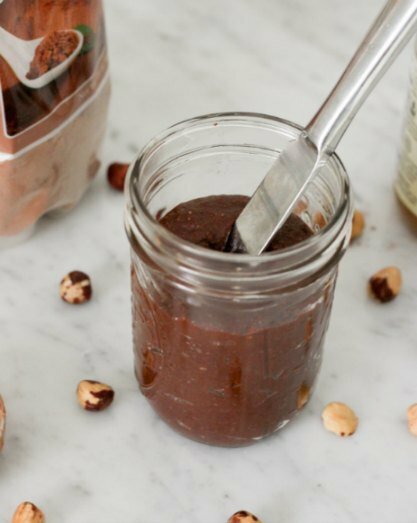 Whipping up a batch of low-sugar Nutella is a breeze and will keep in your fridge for many weeks. Eat it on bread, crackers, cookies – you name it – or use my preferred method of scooping out a spoon full after lunch. It may take a few tries to get this recipe to your exact liking – but it’s worth the effort. You’ll then become “that mom” who sends her kid to school with a Nutella sandwich – albeit a nutritious one, that will keep their bodies and minds fueled for the rest of the afternoon. This recipe is inspired by Sarah Wilson's version in her "I Quit Sugar" cookbook. First, toast the hazelnuts if you purchased them raw. Preheat oven to 350 degrees. Bake on a rimmed baking sheet for 8-10 minutes, until browned. Rub off as much skin as possible. 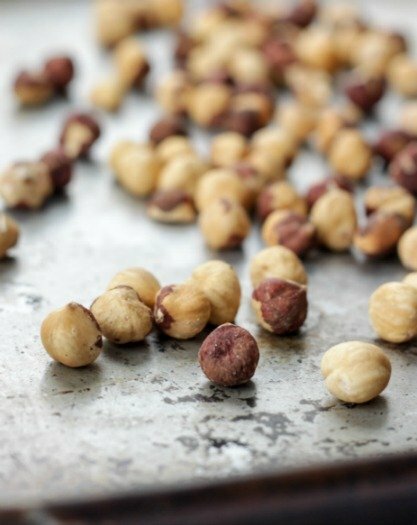 Grind the nuts in a food processor or Vitamix until smooth (if using a Vitamix, achieving a chunky texture is fine at this point). Add the remaining ingredients and process until well mixed. Add extra coconut milk if the mixture is more on the chunky side and you prefer creamy. Store in the fridge for several weeks. Enjoy!